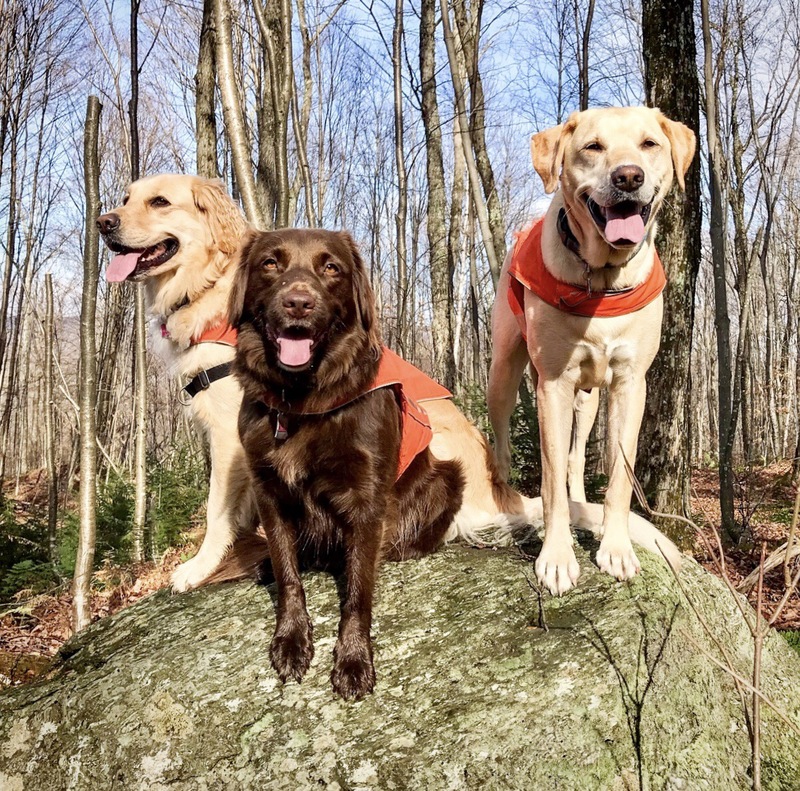 Lucy, Charlie Brown, and Linus in their orange vests on a recent walk in a Vermont state park. Their leashes are at my feet. Fayston, Vermont. My apologies for once again not sticking to my first-Wednesday-of-the-month schedule. Our power was out for a couple of days last week, and our internet was down for over a week. I’m finally back on-line with a new, faster modem. But leash lines, not power lines, are this post’s topic. Do you carry a leash? My town’s leash law allows dogs to be off-leash if they are under voice control. I have yet to meet a dog during our wanders who is actually that obedient. Admittedly, mine are intermittently obedient. Know that I love to let my three dogs off leash. It is wonderful exercise for them as they run at least three miles to each one I walk. They are very happy to explore and play with each other. I have a couple of places where I can do that without too much worry, but the best place is on my own property, which is mostly wooded and has a trail looping through it. We are working on the command “come.” Each of my dogs does fairly well when I work alone with one of them, but when they are together, not so much. Linus and Charlie Brown have selective hearing. They are usually not far; they are too busy to come. We have much work to do. When we are out (and my dogs are on leash), we occasionally encounter unleashed dogs. “Oh, he’s friendly” – I can’t tell you how many times I’ve heard that line from an owner of an unleashed dog. That might be true, but one of my dogs is reactive. Linus is not always friendly. He barks at dogs on t.v. While we are working on that, too, it is the top reason I have him on a leash when we leave our property. It is also why I time my walks to avoid the other “regulars” in my neighborhood. Sometimes we meet, however, and it’s hard. My neighbors are extremely patient and understanding. So, while your dog might be friendly, another dog might not be – please keep that in mind when you let your dogs off leash on a public trail. Always carry a leash, and leash your dog when you come across others. Please. 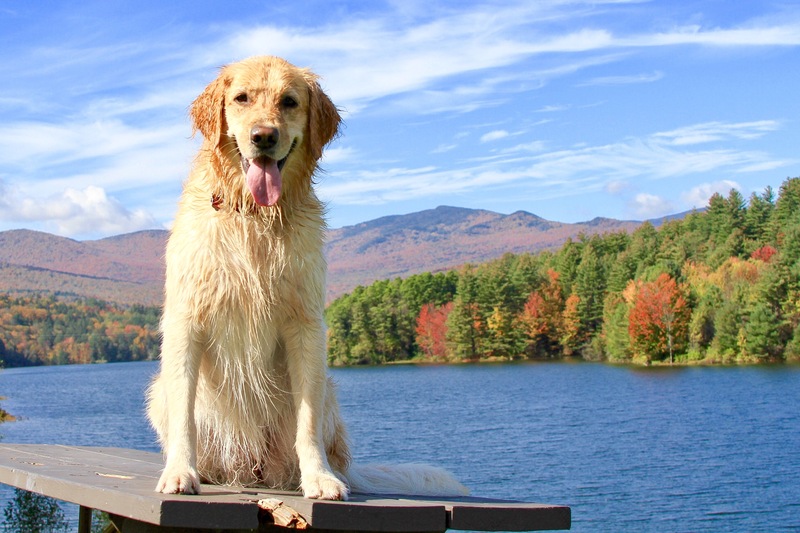 Another reason for keeping dogs on leash during November in Vermont is because it is hunting season. 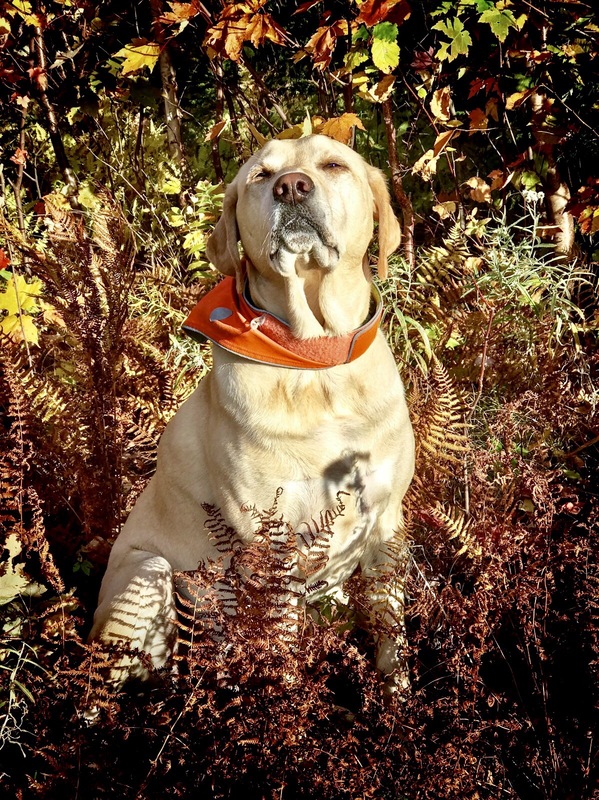 My dogs look adorable in their orange bandanas and vests, but underbrush could conceal and camouflage them. A tired hunter might react simply to movement. To be safe, I keep my dogs leashed. Third, some folks might not want to meet your dog, even if doggo is very friendly. About a month ago, I brought Lucy to the reservoir to swim. The park had just closed for the season, but it was a warm, sunny day. Lucy was on leash as we walked to the water. About 50 yards away, another woman was working with her young dog. The dog was much more interested in Lucy than the owner’s commands and treats. The lady persisted in struggling for his attention. Lucy was oblivious as she just wanted to swim. Swim she did. I had brought my camera and started to take pictures. I noticed a hilltop that would provide a scenic backdrop for a Lucy portrait. After a bit of swimming, I leashed her to walk up the steep hill to see the view. At the top we were immediately and enthusiastically greeted by two off-leash black labs. Their owner was calling them to no avail. The meeting was friendly, but I was overwhelmed by our new friends. In the happy frenzy, I became tangled in Lucy’s leash between three large, wet, jumping dogs and was nearly knocked to the ground. The owner asked me not to unleash Lucy because her dogs had been attacked by off leash dogs. Yep, my pitbill Lucy (on leash) was suddenly attacked by an unleashed dog on a trail in a NY State Forest and ran around me trying to get away, tangling me up in the leash. There was no harm done, but I was not happy. The owners said they never thought anyone else would be out on the trail! It is amazing how many people think they are above the rules and can let their dog run loose. Last year I was working with Willson with a well known trainer in our area. She works for and volunteers for the ASPCA and is deployed to areas where dogs need help. While we were walking, we met a neighbor who told us a story about her unleashed dog who was attacked by two dogs who were leashed. Everybody ended up getting stitches. The trainer told us that it is more common for leashed dogs to attack an unleashed dog who runs over to greet them. (Perhaps they feel trapped) Another good reason to do as you do, leash them while you are in another area where there are other dogs. Great story! Applies to Illinois as well.